auch die meisten Links funktionieren leider nicht mehr. The J.G. Brill Company was founded in 1869 at Philadelphia, Pennsylvania as J.G. Brill & Company, by John George Brill (1817-1888) and his son, George Martin Brill. The elder Brill had come to the United States in 1840 from Germany, where he had learned the cabinetmaker?s trade in Bremen. He found work at Murphy and Allison?s Philadelphia car works, where he rose to the position of foreman of the streetcar shop. In 1868/69 he left and started his own car shop. Brill advertisement from the 1879 Car-Builders? Dictionary. The firm initially built all kinds of cars: horse-drawn streetcars, cable cars, and passenger cars for steam railroads. But by the mid 1880s it was concentrating on the booming streetcar market. As the firm prospered, it was chartered 1887 in Pennsylvania as the J.G. Brill Company, and soon relocated to a large plant on Philadelphia?s Woodland Avenue. In 1899 the company laid plans to consolidate its own activities with those of several other firms into the Consolidated Street Car Company, which would have absorbed 90% of the electric car builders in the United States, but these plans were later abandoned. Brill nevertheless acquired the entire capital stock of several smaller manufacturers such as the American Car Company, St. Louis, Missouri (1902), the G.C. Kuhlman Car Company, Cleveland, Ohio (1904), the John Stephenson Company, Elizabeth, New Jersey (1904) and the Wason Manufacturing Company, Springfield, Massachusetts (1906). It operated all four of these companies under their own names as wholly-owned subsidiaries. 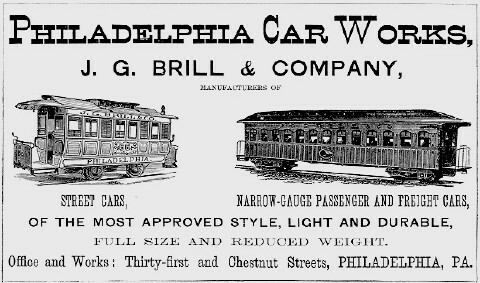 Brill was also one of the leading companies in the 1905 attempt to consolidate a large number of streetcar builders into something akin to a ?trust? to reduce competition and thus improve profits (though they denied this motivation). Unfortunately for Brill and the others involved, they were a day late and a dollar short. Teddy Roosevelt was making a name for himself as a trust-buster, and the effort just sort of evaporated. 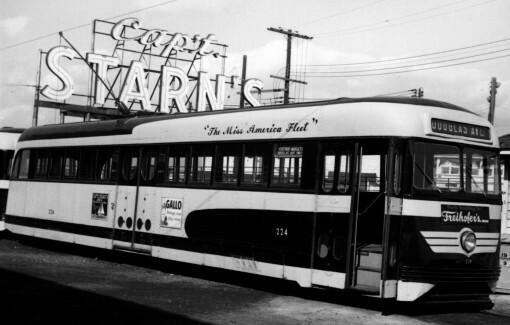 You can read more about this at our page titled The Streetcar Builders Consolidation. Following the failure of the attempted consolidation, Brill was incorporated in Pennsylvania 1 August 1906 and organized on 6 February 1907. It thereafter acquired the majority of the capital stock of the Danville Car Company, Danville, Illinois (1908). All these acquisitions gave the company strategically located plants in most parts of the country. In 1912, Compagnie J.G. 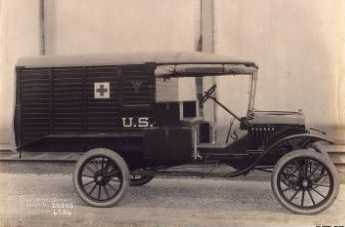 Brill was formed with a plant at Paris, France, that produced cars and trucks for electric lines overseas. In 1917, at the outset of the 1st World War, Brill joined with J. G. White & Company to organize the Springfield Aircraft Corporation, producing airplanes for the war effort. The production of airplanes was completed at the end of 1918. The John Stephenson Company plant in Elizabeth, NJ, was sold in 1919. In 1920, the combined production of all these plants in the production of electric and steam railway cars, trucks and kindred appliances, approximated 3,700 cars and 14,000 trucks per annum. Its principal plant in Philadelphia consisted of some 28 acres. Every conceivable type of car was built by Brill. A few of the more notable Brill designs were the patented Brill Convertible Car, in which removable side panels made the same car either opened or closed; the patented semi-convertible, introduced in 1902, with roof pockets where both sashes lodged, one upon the other; the ?Narragansett? car, an open car with a patented two-step running board to facilitate boarding by women in tight skirts; the heavy steel high-speed articulated cars built in 1926 for the Washington, Baltimore & Annapolis; and the lightweight, high-speed Bullet cars (below) developed in 1930. Brill had patents covering virtually every component of car construction, from trucks to trolley wheels, and the firm pioneered ?package? selling and assembly line production. Brill Corporation was formed in 1926 as a holding company owning controlling stock in J.G. Brill Co. and the various Brill electric car plants. As the trolley industry began its decline in the 1930's, Brill experienced hard times, reporting a $1 million loss in 1933. One by one the Brill plants closed, and production of trolley cars ended at the Philadelphia plant in 1941, at least in part because it sold only thirty of its new Brilliner streetcars. 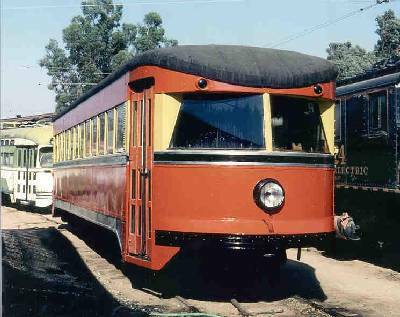 The Brilliner was an attempt to match the PCC car, a design collaboratively developed by industry suppliers and major transit systems to redefine the streetcar in the face of overwhelming automotive competition. Similar in many respects to the PCC, the new car featured styling and colors by famed designer Raymond Loewy, well-known for his efforts on the Pennsylvania?s GG1 electrics. Production of buses continued, and the Brill interests were merged into ACF-Brill Motors, Inc., in July 1944. ACF-Brill Motors itself ceased business in 1954. ?Brill Railless Cars.? Special Bulletin Number Sixteen. Motor Bus Society, Inc., ca. 1960. Electric Cars and Trucks. Philadelphia, PA: J.G. Brill Company, 1895; Reprint Forty Fort, PA: Harold E. Cox, 1971. This is a reprint of Brill?s 1895 catalog. 88 pages. ?Lightweight Cars: 1923 Brill Catalog.? Electric Railway Historic Society Bulletin 47. Chicago, IL: Electric Railway Historical Society, 19__. 20 pages of lightweight cars from Brill?s 1923 catalog. Foesig, Harry. Brill Deck Roof Trolley Cars. Forty Fort, PA: Harold Cox publisher, 1973. Covers the classic Brill cars, electric car, trucks, bottom framing, windows, roofs, open platform, closed platform and painting. 52 pages, b/w photos. Brill?s Last Run: The Brilliner. National Railway Historical Society website. Stephenson/Lisbon Trolley. New Jersey Transportation Heritage Center. Car No. 346 operated in Lisbon, Portugal until 1996 - 90 years after it departed New Jersey. Historical Society of Pennsylvania. The J. G. Brill Company Records, 1877-1930. On-line description of holdings.